No Monument is the long awaited follow up to Hooper's 2013 masterpiece, How To Become A Ghost. Five years is a long wait between albums and it's pretty obvious that the band has emerged from this break somewhat different than how they went into it. Where How To Become A Ghost reveled in the 90s pop stylings of bands like Fig Dish and Tugboat Annie, No Monument takes a different path for most of the album. No Monument is more indebted to different sounds of the 90s this time out, with a very post punk sound that expands the band's songwriting chops, but dampens the hooks a bit. The opening one-two punch of "Red Shift (and the Irish Goodbye)" and "The Method" is a pretty good indication that things have changed since the last time we were hanging with Mr. Hooper. Slower paced, with shifting rhythms and pained vocals, these two songs definitely grabbed my attention and alerted me that Hooper has altered the plan. It's not all doom and gloom however. Even though the first two songs aren't exactly my favorites, from the third track on, this is still a pretty excellent Hooper album. "Unfinished Basements" and "Tides" are more in line with what I was expecting from Hooper, crunchy guitars, energetic song building and hooks that payoff that build. When these guys are on, they are on. Other highlights include the pop nugget "Spit Down A Well" and the more expansive, but no less catchy "Redacted." Any song where the band plays things more straightforward and the tempo is a bit faster tend to be the ones that get my attention. No Monument is still a strong, solid record. 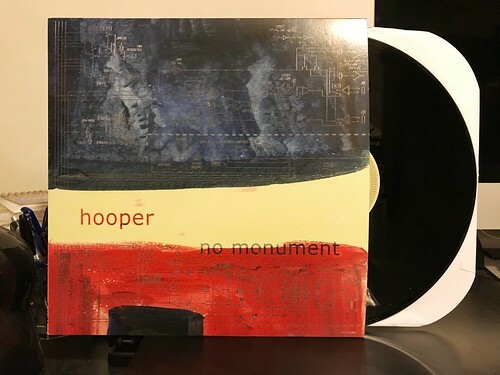 There are moments that I don't like as much as others, but Hooper is still a band worth paying attention to and checking out if you're not already familiar with them. Also, I apologize for that obviously terrible hanging with Mr. Hooper joke earlier in the review. 60' Whales - Hyper Speed 7"
Spells - Big Boring Meeting 7"